Hi Pirates! With warmer weather approaching, pool days, lake trips and beach-bound vacations ahead, we’re starting to pull swim knits from our stashes and make new suits for the summer. 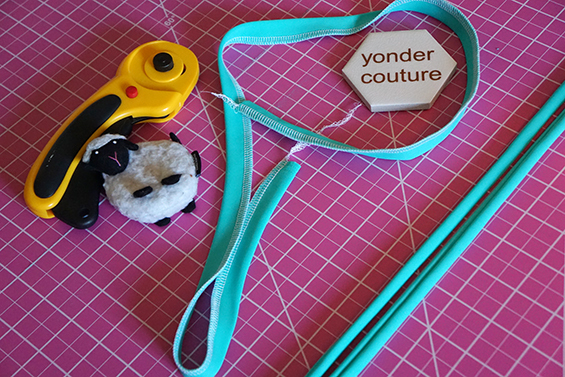 We have Rachel from Yonder Couture on the blog today as a guest writer to share with you the latest hack to the Loggers. In case you missed any of the others (including a fully lined swim option), check it out HERE. I didn’t expect to totally fall in love with Patterns for Pirates latest release, the Women’s Loggers, but P4P knocked it out of the park again with a design loaded with options. 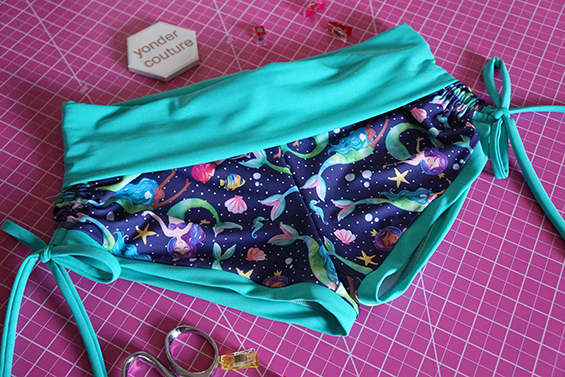 After making a pair of loungewear shorties and a pair of full-length pants from the pattern, I couldn’t shake the vision of swim shorts for paddle-boarding. I wasn’t prepared for the overwhelming reception by the amazing P4P community of sewists. Many asked for the pattern hack. So, here we go! Let’s make swim shorties! Cut two additional strips of fabric, 1.5″ x 36″. These will be your side ties. Fold and press your leg bindings in half and attach to the bottom of leg openings. Be sure to match your center points on the binding and legs. The center point of each will not line up at the center seam. 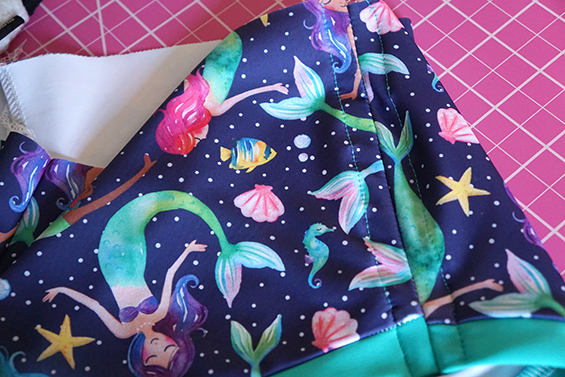 With right sides together, sew a 5/8″ seam along the outside leg seams and press open. Do not use a serger for this step. You are creating casings for your side ties. 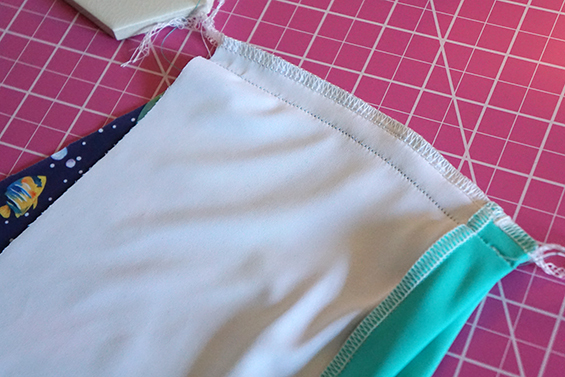 Create a casing on each side of each outside leg seam by sewing a 1/2″ seam. This will secure the edges and provide a new home for your side ties. Attach your choice of Logger’s waistband options per pattern instructions. And you’re ready to have the cutest booty on the lake! If you have any questions, please feel free to reach out to me. I’ll be happy to help. One last note… if you post your makes to social media using the hashtag, #loggers, be prepared for a rash of unusual new followers who cut down trees for a living. Shout out to Rachel for sharing her hack with us! If you’ve used one of the hacks on the blog for the Loggers, be sure to tag us on Instagram or share your pair in the Facebook Group! Tulip Tee Easy Hacks + 100k Sale-A-Bration Day 6! The Tiny Tulip and the Tulip Tee are not only free but also packed with options. Well that didn’t stop the P4P blog contributors team to show you some easy hacks that will give you even more looks. Adding a ruffle is so easy and gives such a cute look! The tulip is a long hemline to add one, so keep that in mind when picking how wide and gathered you’re making it. I choose to make mine just one layer (not folded) with a raw edge so keep it from being heavier on her. I also wish I would’ve not gathered the under tulip section in hindsight! So, learn from me and do the top section that hides under not gathered 🙂 to keep it flatter underneath and lighter as well. I quickly measured my hemline and doubled, plus a bit extra for wiggle room. I cut a few strips to that length and the width I wanted. Another thing to think about is how wide the ruffle will be on the shoulder (you don’t want it wider than the shoulder piece once attached). Mine is about 2″ finished. Seam the strips together and gather using your favorite gathering method. If you need more guidance in gathering here is our blog post with a few ways we like to gather: www.patternsforpirates.com/easy-gathering-methods . I used my serger to gather this time. With right sides together, pin the ruffle to the hemline of the shirt. This is where I would advice to pull the ruffle flat along the top edge of one tulip piece so that it is flat on the under layer instead of completely ruffled like mine. Stitch on. You can top-stitch if you prefer; I didn’t only to keep from adding anymore weight to the top since I was using a light weight rayon spandex. Complete the shirt as the tutorial instructs. Take some cute pictures! We know some of you are not be fans of hemming 😉 so I wanted to show you how easy it is to add a band to the Tulip Tee. Simply sew the side seams as instructed and then measure the bottom raw edge. It is easier to fold the shirt along the back fold and measure as shown below then multiply by two. You will cut the band 2″ by the length of the raw edge. For sizes 4T and smaller you may get away with only one band out of the width of fabric. For bigger sizes, including the women ones you will need to cut the 2-3 band pieces. You can either cut two pieces plus seam allowance and have a seam on the center back or you can cut 3 band pieces, 2″ by the length of the tulip raw edge and one 2″ the length of the back bottom raw edge. Fold the band length wise, wrong sides together and press. Pin in place the band along the raw edge of the tulip and back bottom. 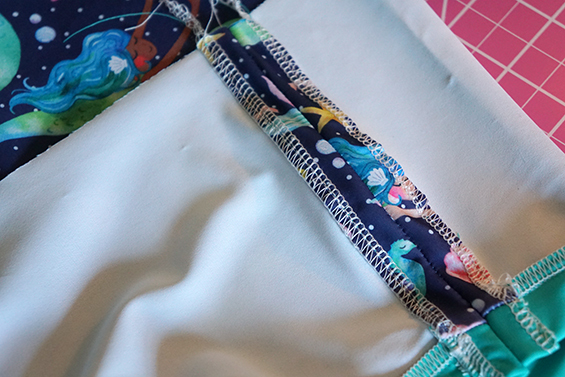 Sew or serge in place with a 1/2″ seam allowance. Optionally top stitch. Press and steam iron and continue sewing as per the tutorial. All done! Super easy, right? Please note that this method will yield a shirt that is 1/2″ longer than the original length. Hate hemming? Then this hack is for you! Adding bands instead of hemming is a great alternative way to finish raw edges. If you’ve sewn other shirts you’ve likely done this technique before; it’s very easy to calculate on your own. Measure your raw sleeve opening. Mine is 7″. Now multiply by 2 – mine is 14″. Multiply by .85 for 85% of the opening. Now add 1 for your 1/2″ seam allowance. My result is 12.9. Cut two bands the width you calculated, and the height around 3″. The stretch should be going the long ways across. Fold in half wrong sides together and then press. Open up the fold and sew the short ends together to make a loop, right sides together. Quarter the loop and mark with pins. Quarter the sleeve and mark with pins, then slip over the sleeve matching the pins, raw edges together, the fold edge towards the neckline. Sew along the edge, then flip around to the right side. You can topstitch the seam if you’d like. Repeat for other sleeve. That’s it! Love the look of wearing a camisole under your tulip tee but don’t want to wear and another layer? Adding a faux cami to the tulip back option is an easy hack that offers a little more coverage and takes only a few quick minutes. For this easy hack you will need to cut both the two tulip back pieces and a plain back piece. Begin by taking the plain back piece and pressing raw edge of bottom hem 1/2” up to wrong side. Hem. 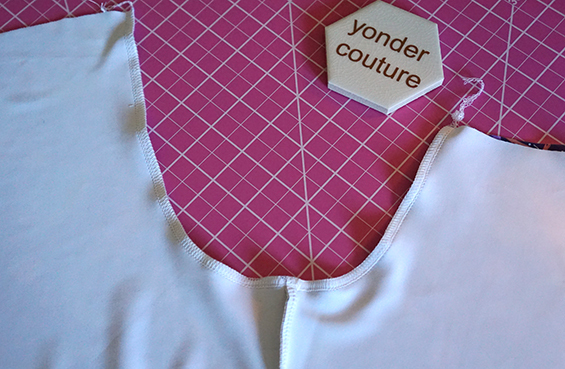 With right sides together, place one tulip bodice on the plain bodice. Pin or clip in place. Repeat with opposite side tulip bodice. Place the plain back piece right side down on top of the front/tulip pieces, matching side seams. Pin or clip in place. 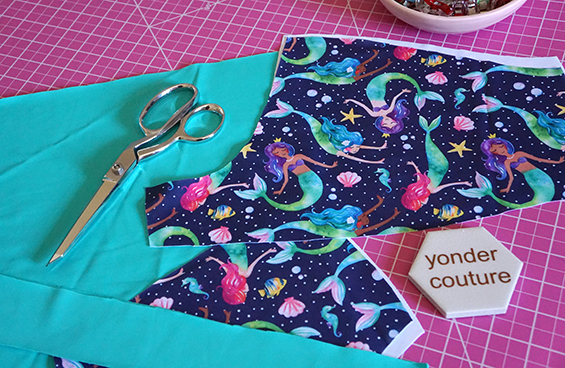 Stitch side seams and then continue on finishing your top as instructed in the pattern tutorial. That’s the whole hack, simple as that! With a couple of small modifications, you can turn the Tulip Tee in to a Tank. Using the tulip crossover piece as a guide for the shoulder width, mark and draw a vertical line to the bottom of the dolman sleeve opening and then draw a horizontal line from the bottom of the dolman sleeve opening to your previously drawn line (shown in red). Next, using a french curve, draw the armscye from the shoulder seam to the bottom of the dolman sleeve, but stopping at the side seam to remove the “wing” of the dolman. (shown in blue). Sew up your top as per the tutorial. To finish the armholes, I chose to hem 1/2″. This will give you a more open and lower armhole. If you prefer to band them, use the same method Elisabeth did above, when adding bands to the short sleeve. (Armband = 2″ by .085 of the opening +1″ seam allowance). We all love a cozy sweater and I couldn’t resist replicating this boutique style top that has been circulating the sewing groups lately. Our Tulip Tee and Tiny Tee were the perfect base. For the Cowl piece I used our Raglan Add-On Cowl and Jolly Roger Add-On Cowl pieces. I did not make any changes here for the size Large or Size 4 youth, but just throwing caution in the wind, check your pieces so that the neckline of the Tulip body and the cowl equal one another before cutting in to your beloved sweater knits. I did not check each size to confirm they all fit exactly. Sew up both the tulip top and Cowl pieces as instructed in their respective tutorials. With right sides together, fold tab in half legnth-wise and stitch. Open tab so that seam is centered and stitch short end. Turn right side out. With wrong sides together, pin tab in place on the wrong side of the cowl, aligning raw edges and to the front of the side seam. Turn Cowl right side out. Mark quarter points on cowl and neckline. With right sides together and matching quarter points, slip cowl inside neckline. Note: the tab should be opposite of the tulip cross over side. If you love our Tulip Hacks as much as we do, be sure to hop on over to our Facebook Group and share with us! Today I’ll be talking about P4P patterns and maternity! We got lots of questions in the Facebook group about what kinds of patterns can be used for maternity as-is and what kind of modifications or hacks can be done in order to make patterns maternity friendly. I’ll go over a categorization for P4P patterns and which ones can be worn both pre, during, and post maternity and how to do a simple hack to make most other knit top/dress/swim patterns accommodate a bump. For links to all patterns, check out the women’s section of the shop. These patterns should work for most women for a majority of pregnancy, if not the whole way. Some women may prefer more ease than others. Here’s examples of how these some of these patterns fit with no mods on a 22 week bump! For most women, a simple hack I’ll show you below should make these patterns pregnancy-friendly. Disclaimer: Some women have had success wearing some of these patterns without any mods during pregnancy, or towards the beginning of pregnancy. Personal body shape, fabric choice and fit preference will play a large role in this. I would suggest using the hack in general because they will likely fit better this way. Could possibly work very early pregnancy. Before you cut into your fabric, you will want to double check your measurements because they will definitely be in flux during pregnancy. To ensure the best fit, choose the size that you currently measure, not just your pre-pregnancy size. For this tutorial, I chose to show how to use the Layer Me Up Maternity Add-On with the Essential Tank. 1. Assemble your desired pattern. You will only need to alter the front piece. 3. 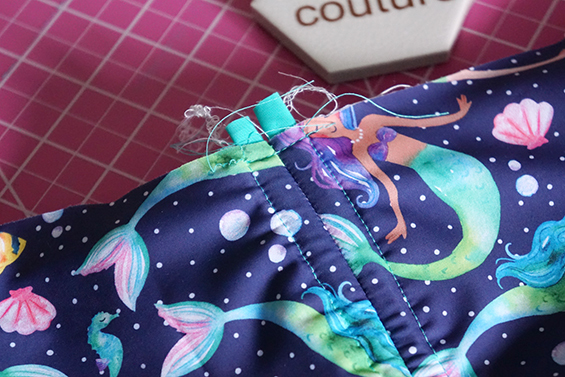 Lay the add-on on top of your pattern piece, roughly 1″-2″ below the armpit curve. 4. Note the difference between two of the same hem lengths on your pattern and the add-on. In this case, the difference was 5″ between hemmed shirt lengths. 5. Add this difference in length to your pattern piece, just above the hem. 5. Grade between your piece and the add-on in the stomach area, making sure to keep your lines smooth. 6. Trace your new pattern piece on to a new sheet of paper, to make things easier. 7. Make sure to transfer the notches from the add-on. Your elastic will be stretched here. 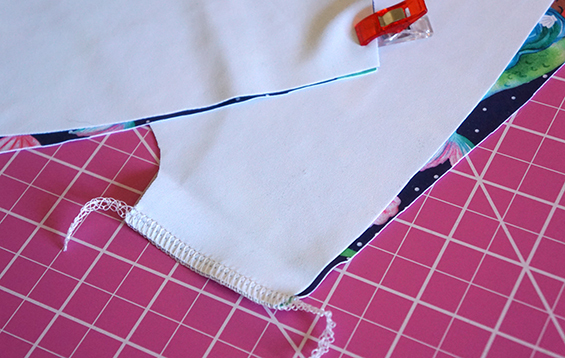 After you’re done making the changes to your pattern, add the elastic as shown in the Layer Me Up Add-On instructions. 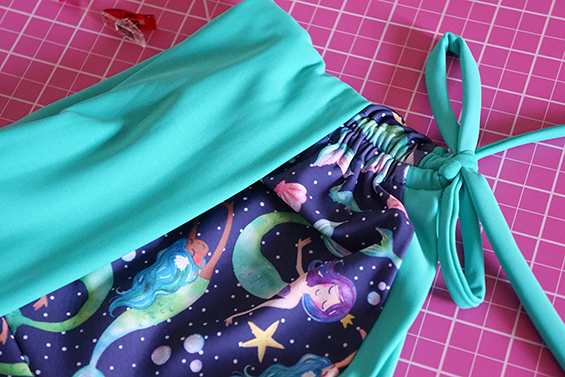 Then, finish sewing up your desired pattern as per those instructions. That’s it! Use these same guidelines to combine the add-on with any of the patterns shown on the Simple Hack Suggested list above. As a bonus, I’ll also point out that knit pants with an elastic waist can be easily adjusted for under-belly maternity wear by slightly decreasing the rise. (See this post for more info on adjusting the rise.) 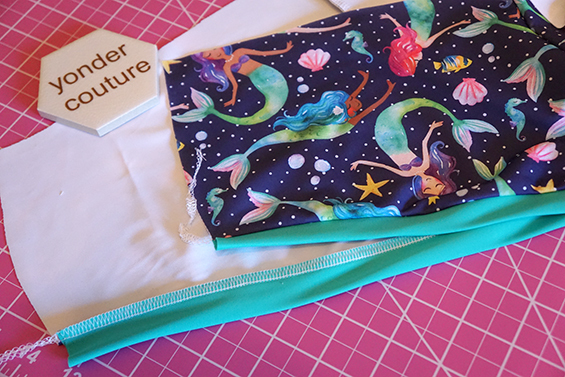 I lowered the rise about 1.5″ on the front of the Mama Bear Joggers to make these shorts maternity-friendly. 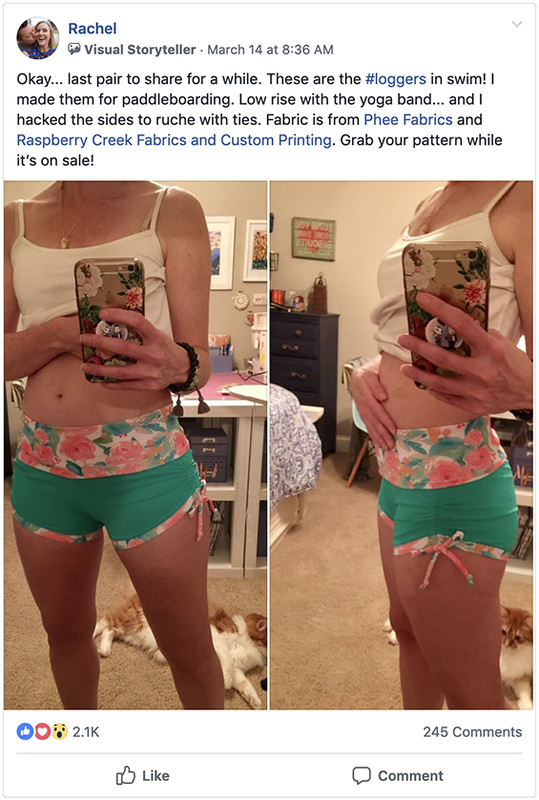 Feel free to try this out with any knit P4P shorts or pants. You could try it with woven pants as well, if you are more adventurous as this may require more adjusting. Don’t forget the Peg Legs have the Maternity Add-On as well, which works perfectly! With just a little hacking, a lot of patterns can easily be made maternity friendly. Happy sewing!